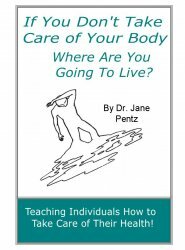 AASDN Virtual Online Store > Publications > If You Don't Take Care of Your Body Where Are You Going to Live? We may not have control over what life throws at us but there is much we do have control over when it comes to our health. If You Don't Take Care of Your Body Where Are You Going to Live teaches individuals how to take "charge" of their health. No more excuses. Books mailed within 7 business days. All sales are final and no refunds given for publications.